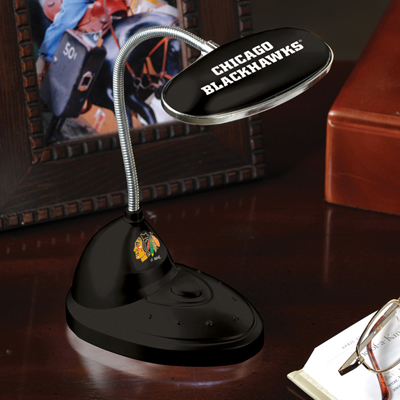 Show your team spirit while brightening up your room or work area with this officially licensed Chicago Blackhawks LED desk lamp from The Memory Company®. The desk lamp is made of durable plastic and is features the team logo and authentic team colors in vibrant style. The 6.5” flexible neck makes it easy to adjust to your lighting needs. Requires 3 “AA” Batteries (Not Included). Measures 11.5” Tall by 3” Wide.